To secure the data using smart card it is very essential to authenticate the user password and provide session key agreement over the unreliable networks. To check the authenticity or validity of the remote users, smart cards based on password authentication is the best mechanism to solve this problem. There are various password authentication mechanisms proposed by different researchers have its own merits and demerits. In this proposed scheme, a more efficient and secure untraceable remote user password authentication scheme using smart card with session key agreement, we compared other password authentication schemes based on smart card and found that the proposed scheme have various security features which are not present in other schemes. The various security features include as: (1) Verifier table is not required; (2) identity of the user can not be trace out; (3) smart card having inbuilt verification mechanism; (4) facility of mutual authentication on both sides user/server is present; (5) facility of session key between user/server is present; (6) provide quick wrong password detection; (7) provide secure password select/update facility; (8) provide forward secrecy; (9) the storage cost/operational cost/authentication cost are minimum; (10) privacy of the user can be protected; (11) timestamp at every phase of authentication is required; (12) in the situation of damage/misplace of smart card, server can reissue the same without altering the identity. R. Madhusudhan, R. C. Mittal. Dynamic ID-based remote user password authentication schemes using smart cards: A review. J. of Network and Computer Application 35; 2012, p. 1235–1248. doi: 10.1016/j.jnca.2012.01.007. Wen F, Li X. An improved dynamic ID-based remote user authentication with key agreement scheme. Journal of computers and electrical engineering 38 (2012), 381–387. Doi: 10.1016/j.compeleceng.2011.11.010. Chang Y F, Tai W L, Chang H C. Untraceable dynamic identity based remote user authentication scheme with verifiable password update. International Journal communication system 2013. http://dx.doi.org/10.1002/dac.2552. Wang Y Y, Liu J Y, Xiao F X, Dan J. A more efficient and secure dynamic ID-based remote user authentication scheme. Journal of computer communication 32 (2009), pp 583–585. http://dx.doi.org/10.1016/j.comcom.2008.11.008. Khan M K, Kim S K, Alghathbar K. Cryptanalysis and security enhancement of a more efficient & secure dynamic ID-based remote user authentication scheme. Journal of computer communication 34 (2011), pp 305–309. http://dx.doi.org/10.1016/j.comcom.2010.02.011. Qi Xie. Improvements of a security enhanced one-time two-factor authentication and key agreement scheme. Scientia Iranica D; 2012, 19 (6), p. 1856–1860. doi: 10.1016/j.scient.2012.02.029. Xiong Li, Jianwei Niu, Muhammad Khurram Khan, Junguo Liao. An enhanced smart card based remote user password authentication scheme. J. of Network and Computer Applications 36; 2013, p. 1365–1371. http://dx.doi.org/10.1016/j.jnca.2013.02.034. Hsieh W B, Leu J S. Exploiting hash functions to intensify the remote user authentication scheme. 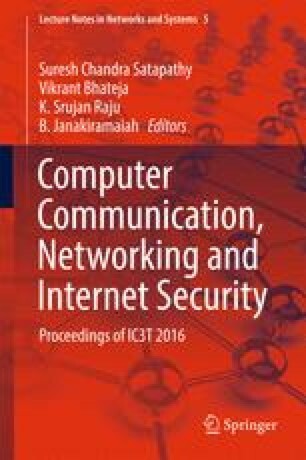 Computer & Security 31 (2012), pp 791–798. http://dx.doi.org/10.1016/j.cose.2012.06.001. Marimuthu Karuppiah, R. Saravanan. A secure remote user mutual authentication scheme using smart cards. J of information security and applications 19; 2014, p. 282–294. http://dx.doi.org/10.1016/j.jisa.2014.09.006. Min-Shiang Hwang. A Simple Remote User Authentication Scheme. Mathematical and Computer Modelling 36; 2002, p. 103–107. Password Authentication scheme over insecure networks. J. of Computer and System Sciences 72 (2006), p. 727–740. doi: 10.1016/j.jcss.2005.10.001.